So there I was ... staring into the fridge at leftover chicken breasts and zucchini from previous recipes, and no idea what to do with them. Oh, yeah, that package of soy wrappers I bought like the day after Passover, when just about anything chometz looks absolutely wonderful, thinking I would use it for something in the near future. "What in heaven's name is a soy wrapper?" you might be thinking at this point. Well, Dear Reader, a soy wrapper is the soy equivalent to the seaweed layer in sushi. In other word, land plant-based, rather than water plant-based. "Near future" eventually became the other night. Soy wrappers ... I could finally use them up as well as the chicken! Yay! Another two-fer! Elephant Ears and Zucchini Muffins are in my freezer, waiting to be defrosted for guests to dig into this weekend. But it seemed unfair to allow them only two choices. So when I happened upon bamitbach and her post about Blueberry Buns, there, staring at me, was the perfect third choice. 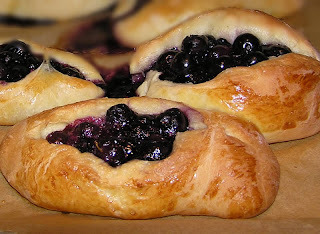 Sweet blueberries, gently swaddled in a challah bun. I was gaining weight just reading the post. These are the blueberries after 10 minutes. They were supposed to macerate (cook-speak for soften) for only 5. But as a disclaimer, the blueberries were partially defrosted. Maybe it would have combined better if they were fresh. Or totally defrosted. In any event, a lot of sugar was left behind in the dish, yet the blueberries managed to gel nicely during the baking and cooling process anyway. Sometimes I don't know why I bother to conjure up (or look up or clip out or down load) new recipes ... theHubby and Sons would be happy with pasta 7 times a week (no, really 14 times a week, with the other 7 meals cold cereal and milk). Remember The Far Side, that one-panel cartoon? There was one that sums up how my guys feel about food. I would link to it, but sadly there is no place on the intertubes that show the particular comic (legally, anyway). I don't have it in front of me, but here is how I recall it: two dogs are sitting in the kitchen watching their human prepare their dinner. One dog says to the other, "Oh, boy! Dog food again!" If you read yesterday's post, you know that this coming weekend houseguests will be destroying visiting my humble abode. Serving only one type of snack is just wrong. Allowing a humongous zucchini to compost in my fridge is also very wrong. 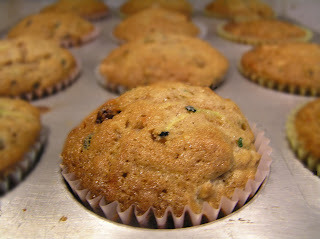 Well, you know what they say -- when life gives you zucchini, make zucchini muffins! Woo-hoo! Two problems solved! Oh, yeah, the muffins. The original recipe uses butter, but I've made the parve alternative a number of times, and no one has ever noticed or complained. Of course no one ever did ... they were too busy stuffing their faces with these tender jobbies to make anything but yummy noises. This coming weekend, my house will be descended upon by a massive horde (definition: anything over 1 guest is a horde by me) in anticipation of olderChild's engagement party. I don't have to do any cooking for the party since it's at my MIL's house and the entire soiree will be catered, but I do have to feed a snack or two to the 4 guests staying at my house. Plus dinner. This past Thursday, a fellow library co-worker handed me one of our latest acquisitions, The Kosher Bakerby Paula Shoyer,just before itwas about to hit our new book section. Ohboyohboyohboy! O frabjus day! Easy to make parve goodies! Oooh, Elephant Ears! Only 3 ingredients if you don't count the dusting flour! Woo-hoo!